The city fringe meditation space began in 2006 at 99 Crown St, East Sydney. Its founders are two professionals who have studied meditation and personal development for over 35 years from different philosophies and practices. Both actively practice BK Raj Yoga meditation as taught by Brahma Kumaris, a worldwide organization who offers meditation classes and reaffirms the spiritual identity, inherent goodness, dignity and worth of the human being. city fringe meditation space aims to provide meditation and personal development courses, events talks on a donation basis to the local community. It seemed that money is often a barrier to people participating in such courses. The ability to participate on a donation basis is felt by people as a new and unifying force in the community. The quest to prove that the inherent goodness in everyone is an abundant resource is alive and growing with every event. 2010 city fringe meditation space organises a series of Inner Dialogues. The Inner Dialogues are conversations about the state of our inner world and its influence on our relationships, our work and quality of life. The sessions will be informal and friendly and will be punctuated with some quiet reflection and meditation. November 2010 city fringe meditation space organises the Sydney Symposium - Synergies - New Consciousness for our Future with a group of dedicated volunteers and many external speakers. The Symposium features one day of panel discussions and 4 half day workshops the following day. 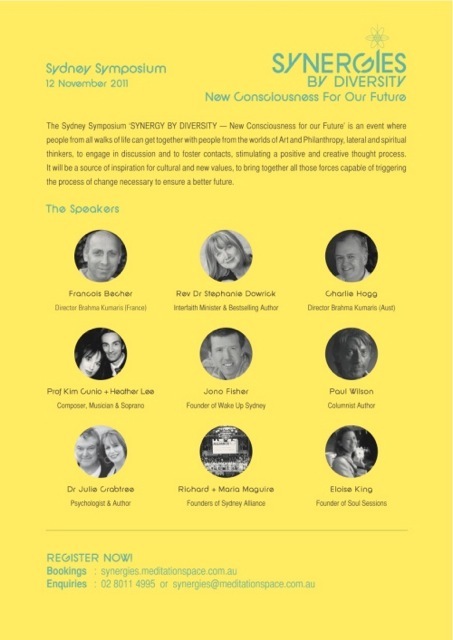 November 2011 city fringe meditation space organizes a second Sydney Symposium - Synergy by Diversity - New Consciousness for our Future with a group of dedicated volunteers and many external speakers. The Symposium features one day of panel discussions and 6 half day workshops the following day. 2011 The media room comes as an additional room to run courses and smaller events to the mix of rooms available. If you like to support us in what we are doing get involved at the city fringe meditation space.